My friend Lexie got a sewing machine and outed herself today as a fabric junkie. I suggest she enter a 12-step program. Step One: I''ll take that offending substance off her hands. My sister (Whose blog is not public. Gah. What kind of sister of mine is not all about the attention?!) 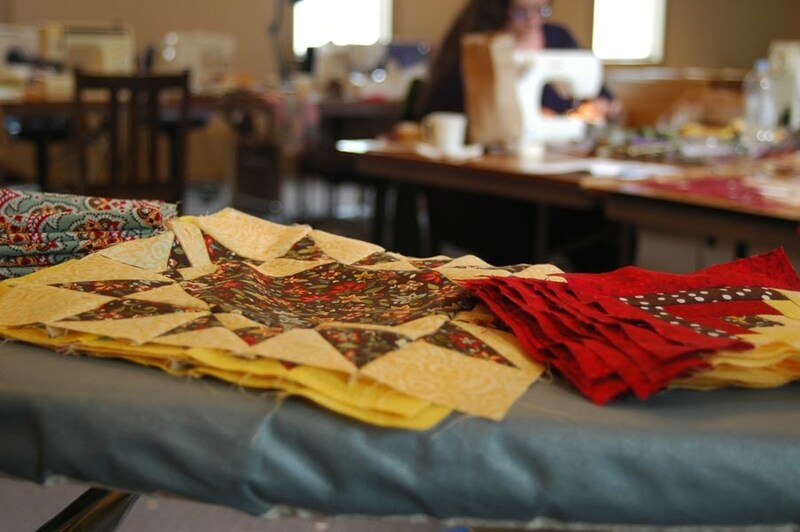 joined me earlier this year in retreating for a weekend of quilty goodness. She, too, is a burgeoning fabric addict on a slippery slope. But don't think I'm a pusher. My friend Katie, also, she sews a mean streak. She sews dresses from pillowcases and slipcovers from remnants and probably was the inspiration behind a little book called StitchAholic. Her first step, I'm thinking, should be to hand over the stash to one who can watch over it for her. I mean, I'm prepared to help. I sewed through making umpteen cups of "cold cocoa" (known as "chocolate milk" unless you're a particularly particular child of mine) for Laura and through just as many sessions of nursing Salvador. I sewed while Gracie spent her last day as a 6-year-old just as Gidgety as ever, never once glancing at the plainly visible increasing stack of finished items. Oh, to be that happy-go-lucky. Grace is a butterfly of a girl, you see, alighting on a flower here, a sunny spot there, gently unfolding her wings in the most springlike manner. 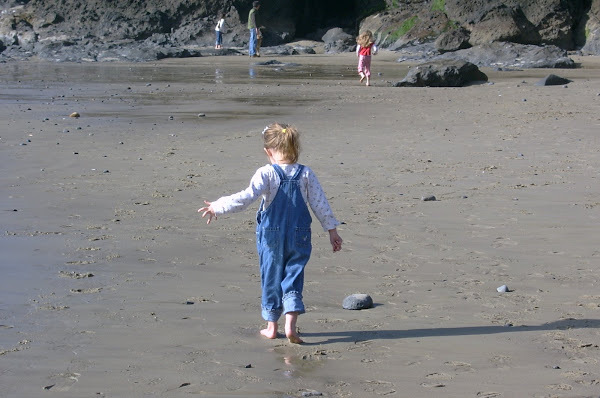 Any other of my children would have had twenty questions, no fewer, for me, about the pile of bright floral and gingham fabrics. Any other of my children would have started asking me to sew something specific. Not Grace. Grace Hannah collects happinesses like I collect pretty bits of floral fabric. She just does. She can't help it. Just last night, to give you an example of Grace's way of walking through the world, this same child burst into my bedroom at well past midnight. A headlamp blinded me as she excitedly bounced up and down on my side of the bed, waving two books in and out of the glow. "I finished these, Mom! Do you want me to read them to you?" "I want you to know what happens!" There is something undeniable about Grace. She is enthusiastic; she's single-minded until she's inevitably distracted; she's effervescent. It didn't occur to her last night that she busted herself for reading well past "lights out" just as it didn't occur to her today that I might be sewing her birthday gifts in plain sight. She's just so full of joy, that girl. She's good medicine in a world that doesn't seem fluttery nor innocent right this minute. What did I sew, you ask? I slashed through a lot of my own personal stash creating a wardrobe for Grace's as-yet-unmet dream doll: Samantha, a beauty of an American Girl that my mom bought for our gorgeous middlest's seventh birthday. Samantha now has one period (1904-ish) outfit, three skirt-and-sweater sets and a pair of pajamas. Grace also has a lookalike skirt set so she and Samantha can dress in matchy-match glory tomorrow. And now I feel as giddy as Grace! I can't wait to wake up in the morning and see her open her gifts! I couldn't be more pleased to bust through fabric than for this reason. It was a delicious day of sewing and school and reflecting on Grace's sparkly seven-year life. Plus I made some room for more fabric. Isn't that the way it works? Happy Birthday to a most effervescent (love that) little seven year old. Can we squeeze in a fabric shopping date in the very near future? All this talk of fabric has me itching to get to Joann's. Pictures, please! I covet your mad skillz. I has no sewing skillz at all. I love how your describe your girl. Hope to see her face and the little clothes on her birthday!! Oh, Barb, you are the knittingest woman I know! The purse you knit for me is my pride and joy and inspiration all in one. What a delightful child you have! I can't WAAAAIT to see pictures! Tell me you will have pictures up soon. Pleeeeze? And thanks for outing me yet some MORE. I want to go to Joanns too. I feel itchy.